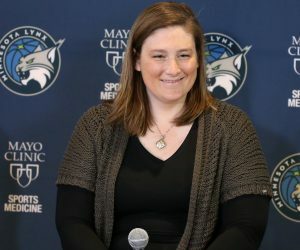 The Lynx hit a home run in the 2019 WNBA Draft. They got deeper, tougher, and better on both sides of the ball. They added players who can shoot, players who can defend and players with diverse skillsets that will be able to help the team right away and down the line. With five picks in the draft and four in the top 20, the Lynx came into the night feeling like they had the chance to seriously improve their team. The team picked: Napheesa Collier, Jessica Shepard, Cierra Dillard and Kenisha Bell. They also traded the No. 18 pick to the Connecticut Sun for Lexie Brown, who was taken with the No. 9 pick last year. 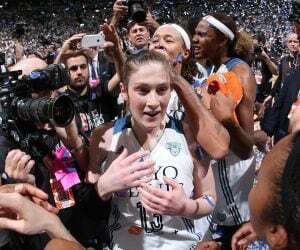 “It was just a really good night for the Minnesota Lynx. We’re excited, we got a haul of talent that we needed. 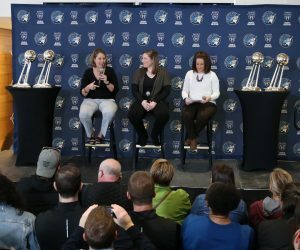 I thought that we maximized value at each pick,” said the Lynx general manager and head coach Cheryl Reeve after the draft. In Collier, the Lynx got a player who they feel can play right away. Collier is a great defender and rebounder, who scores very efficiently. She’s one of those players that does seemingly everything on the court. You can read more about her here. The Lynx were very excited when Collier was still there at No. 6. Earlier in the week they were fairly sure she was going to go earlier. At No. 16 the Lynx got someone who they didn’t think would fall to them in Shepard. A tenacious rebounder and an incredibly strong player down low, Shepard has a lot of Rebekkah Brunson to her game which is something the Lynx might need this season as Brunson’s future is still in doubt. Shepard also projects as a decent three-point shooter in the WNBA even though she didn’t take many at Notre Dame. The Lynx badly wanted to draft Brown last year. They liked her shooting and her defensive abilities, but she was taken at No. 9 by the Sun and the Lynx ended up moving their pick. Brown will have a chance to prove herself in a deep and talented group of Minnesota guards. Competition will be fierce, but it will make everyone who is a part of that group a better player. That includes the Lynx’s No. 20 selection, Cierra Dillard. Dillard is a ferocious point guard with a sweet shooting stroke who dominated in college. She knows she’s going to have to work hard to make it in the WNBA, but she’s up to the task. “Cierra Dillard, this is a young lady that is just so excited to be drafted and to be selected by the Lynx. She’s got some swag to her. She’s got a three ball. She’s unafraid. That was something that is really appealing to us just to add some depth, give us some more options in the backcourt,” said Reeve. With their final pick, the Lynx took Bell from the University of Minnesota. 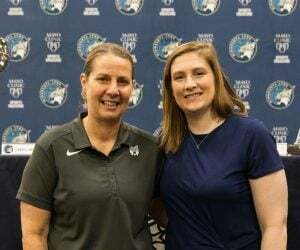 Fittingly, Bell becomes the first player taken from Lindsay Whalen’s program at the U of M. However, don’t think for a second that this was just a favor to a former Lynx legend. Reeve things Kenisha has a shot. “Kenisha can defend, I told Lindsay I’m going to ask her to shoot more from the outside as opposed to always driving. It’s hard in our league when you get in there so I’m excited to see what Kenisha can do,” said Reeve. “She defends and she’s an elite athlete. Those two things are an automatic get her in to camp and see if you can learn about her offensively,” she continued. Looking at the players the Lynx selected in this year’s draft gives a sense of how they’re going to play in 2019. They will still be entered around Sylvia Fowles, but they hope that they can have a more even distribution of scoring around her, and they believe their defense will be better as well. Everyone on the roster is excited about how the draft ended up and they’re excited to return for what is certain to be a very intense training camp. Bringing in players who work as hard as these players do elevates the level of play for everyone. 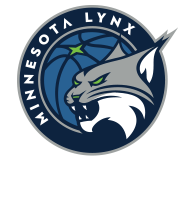 Internal competition is a good thing and the Lynx will support one another as they all fight to earn roster spots and playing time.